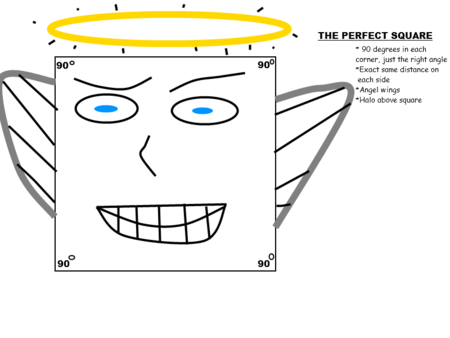 "The Perfect Square". Flawless, jazzy, and glamorous. A square, yes, a plain old boring square could be SO MUCH MORE than just the average everyday polygon. The circle is unique, having association with π, circumference, diameter, radius, and the ability to measure 360° on a bicycle super-turn. The influence of the almighty circle has even made its way into popular video games, such as the first-person shooter game Call of Duty. The circle has inspired the famous signature move, the 360° no-scope. Triangles are cool too, having three sides and all. Being the visual faces on EACH and EVERY ONE of the Egyptian pyramids. This TOTALLY beats out the square. Do YOU see squares making geographic fashion statements throughout Egypt? NO! Squares coexisted alongside the other much more hip and widely accepted shapes for years, and even centuries with absolutely no respect for them, whatsoever. Squares were a mockery. (Hence the insult for squares) It was hopeless, squares would NEVER be cool. Then everything changed when the mathematics nation attacked. Don't get me STARTED on the angle. You wouldn't have seen the angle until you actually took a gaze into the sensation. The way all sides were exactly 90° in each corner... just the right degree of perfection. It was near to literally impossible to even begin to imagine or possibly even start to comprehend such a magnificent sight. You couldn't even guess how much of a beautiful sight this degree of perfection was. OOH! The glamour! The question was, where was this unblemished square's root? To all we know, only the great Geometry gods have this knowledge on this perfection creation in geometry. It was a disaster for the other shapes. Even all the other shapes, such as the great parallel lines of the universe even awed upon sight of this spectacular perfection in shape and form. The CIRCLE even ended up going through this catastrophic uproar, with the loss of last 360° admirers. It was even so god-like that the nerd who was so far in counting all the digits of π even stopped counting to get a glimpse at this angel. The beauty within the square was one that even converted Christians into worshiping the geometric gods. Finally, squares had a positive reputation. No longer was a square for squares. Not with the new, the beauty, the incomparable, the almighty, the cool, and the flawless perfect square. Number Theory: Complex numbers · Fermat's Last Theorem · Fermat's Penultimate Theorem · Fibonacci Sequence · Imaginary Number · Integer · Numbers · Negative Numbers · Odd · Pi · Approximations of pi · Prime number · Rational numbers · The largest number · Legend of Zelda Link theory · Is one a number? This page was last edited on 24 September 2014, at 00:18.